Enchiladas are a hearty favorite in many homes. They can be made with almost any type of meat, but for Meatless Monday, why not give this colorful veggie version a try. We’ve also crafted a tangy mole enchilada sauce that will knock your socks off! Make the mole sauce the day before. The flavors will only get better. Mix the chili powder, cayenne, cocoa, cumin, oregano and salt in a small bowl and set aside. Skin and chop onion, then drizzle 2 tablespoons of olive oil in a saute or large sauce pan. Over high heat, sauté half of the onions until they are translucent, about 5 minutes. Add water to deglaze pan and reduce heat to low. After about 5 minutes, add tomato sauce and adjust seasoning to taste. Simmer for about 15-20 minutes, then allow to cool. After about an hour of cooling, puree by using hand mixer or food processor. Set aside or place in the fridge in a covered container until final prep stages. Preheat oven to 375 degrees and spray small baking dish with cooking spray. Pour about 3/4 cup of mole sauce into bottom of dish and set aside. In a skillet, drizzle canola oil and sauté the rest of the onion over high heat. After 3-4 minutes, add squash. Brown for about 4-5 minutes then remove from heat and immediately transfer to a room temperature mixing bowl (you want the squash to stop cooking). Add ricotta, black beans, red pepper, and most of the cilantro (you can use the rest for garnish when serving). 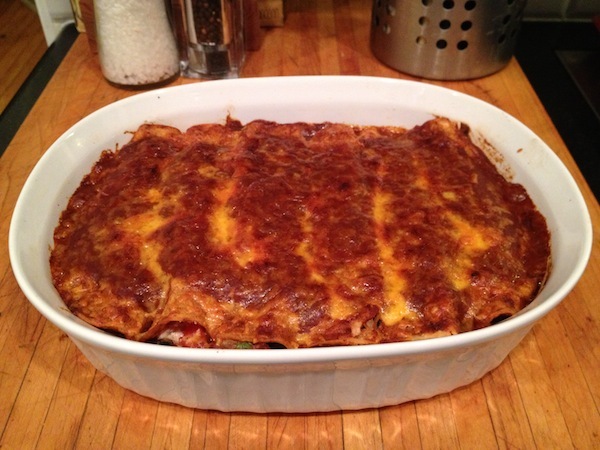 Stir gently but thoroughly – and voila – you have your enchilada innards. The last step is messy, but is worth it. Using the same skillet as before, heat a little more canola oil, and lightly saute corn tortillas, one at a time. After each, dry/cool on paper towels. On a prep plate, pour a little mole sauce, then set first corn tortilla on plate. Flip it over, making sure that both sides are lightly coated. Add bean/squash mix in center, sprinkle with cheddar cheese, then fold over in thirds and place seam down into dish. Continue with the rest of the enchiladas. Pour the remainder of the mole sauce over the top and sprinkle with the remaining cheese. Bake for 20 minutes covered, then set broiler on, remove lid, and broil for another 4-5 minutes. Cool for 5-10 minutes and serve with chopped cilantro. Find out more about inSHAPE Fitness. Be sure to check them out at www.inshape-fitness.com, on Facebook, and on Twitter.